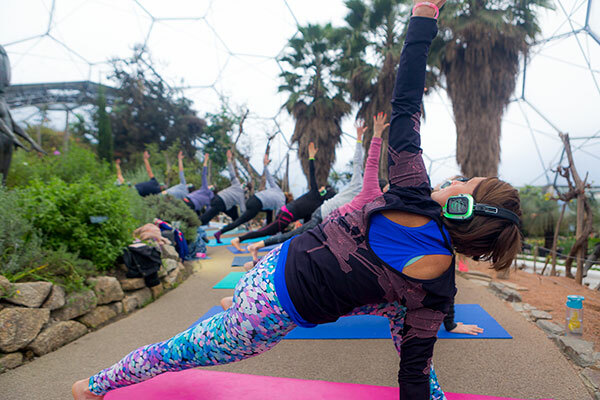 Silent Disco Yoga at the EDEN Project! We are incredibly excited to be able to host our fourth major Silent Disco Yoga event at the EDEN Project. This is one event not to be missed. Nestled in the lush undergrowth of the Mediterranean Biome, we will be hosting an unforgettable Silent Disco Yoga experience not to be missed. June is a truly magical place in Cornwall and having the opportunity to practice amongst a biome in full bloom will surely be spectacular! Imagine a dynamic yoga class alongside an uplifting playlist in one of the most memorable locations you could think of, with inquisitive birds hopping around and the smell of plants filling the air…and not having to rely on the great Cornish weather! The culmination of 300 people all practicing yoga together really brings about a unique and special energy that will leave you feeling uplifted and connected with yourself and everyone around you. You’ll be practicing wearing a pair of specialised wireless headphones so you can clearly hear the class instructions from our teacher, Jen, as well as the beats from beautiful music that has been carefully chosen to enhance the movements. This will be an all levels vinyasa flow class, beginners are welcome and options will be given for all. Demonstrators will be dotted around the main areas of the biome on stages so you can see the postures if you need to, although you are welcome to explore the pathways and nooks to find a tucked away area to practice in and immerse yourself in the magical environment that Eden has created! Although the biome is large, these events always sell out so please purchase your tickets early so you don’t miss out. Once we are full, we are full.